Anna the Red, you win at life. The Japanese-born, New York City-based artist has made some of the best kyaraben I’ve seen, and more unusually, they look delicious (Sakurako Kitsa’s bentos are also beautiful, but I don’t want to eat them). 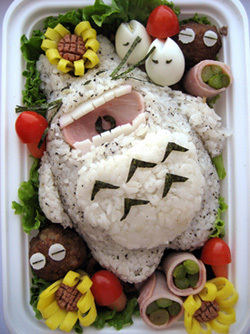 My favorites are the Sleeping Totoro bento (left, with sausage balls hiding in its belly) & the Ohmu (Nausicaa) bento. She’s also generous with instructions and close-ups, in case you want to replicate anything.